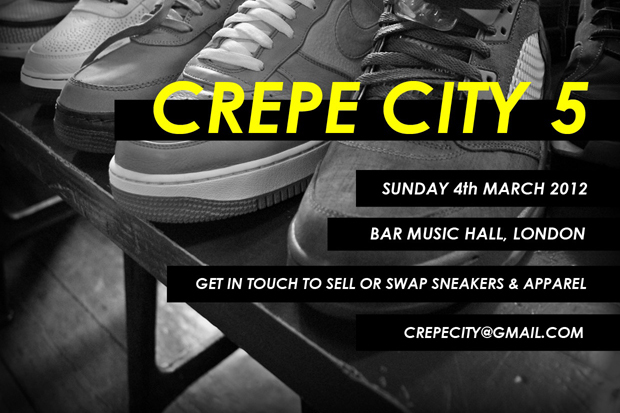 London’s very own sneaker festival Crepe City returns tomorrow with their 5th outing. For those who are unfamiliar with Crepe City, the concept is pretty simple; sneaker collectors from all over the UK come together to sell their sneakers. It’s a one day buying / selling fest of rare and collectable sneakers, some old, some recent, but plenty of variety. Well over 1,000 sneakers to be precise. You also get the odd bit of clothing and accessories. Some have been fortunate to pick up the Supreme boxing gloves in the past (ahem, Suffocake). Head down to Bar Music Hall in Shoreditch tomorrow to pick up a rarity. Why do i not live in London!